Bitcoin and The Blockchain: What Is EOS? Just another crypto coin, Right? This was what I thought when I first learned about EOS in January of this year. 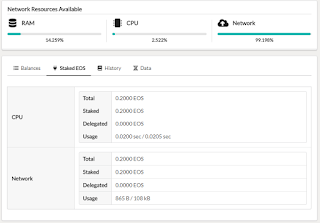 Now that the EOS mainchain is launched and I have been able to play around with the EOS ecosystem, what I discovered is totally mind blowing. What is an EOS account? When you open up your EOS wallet and look at your account, this is what you see. The components in your account are CPU, Network and Ram! This is a computer!! Your account is describing the power and resources your computer has. The amount of CPU ( EOS staked), the amount of bandwidth or network (EOS staked) and amount of RAM available. The smallest "account computer" possible is 0.1 EOS of CPU, 0.1 EOS of Bandwidth and about 4 Kb of Ram. This represent the minimum share in the power of the main "EOS computer" run by the Block Producers. Like a computer the RAM is where all the critical data for instant access by the "EOS computer" is stored. Think of the "EOS computer" as a computer in the cloud and all EOS accounts are just different size computers that can use the resources of this "computer in the cloud" depending on the amount of EOS staked. Sending tokens, broadcasting, buying ram, running Dapps, voting and much more. This is very different from what we have been used to thus far. With Bitcoin when we send a transaction say sending 0.01 BTC to another account we pay a fee of hopefully 0.0001 BTC which goes to the miner and the recipient gets 0.0099 BTC. ( Ethereum works in much the same way.) 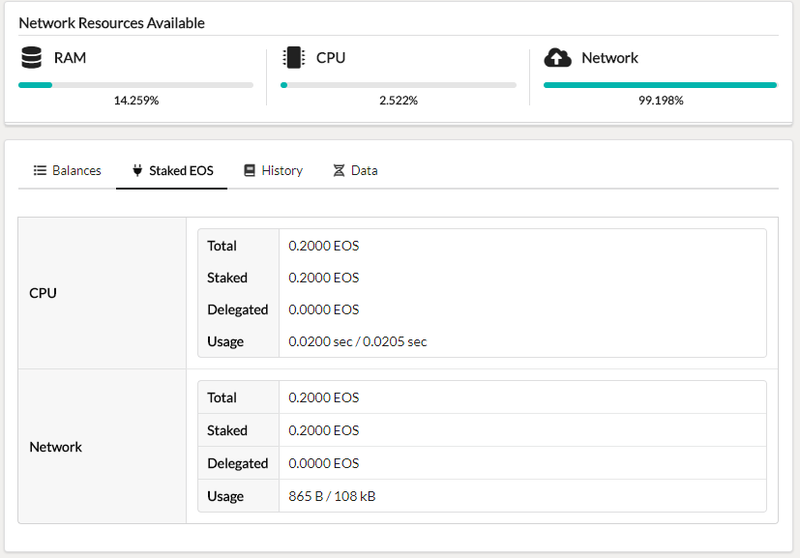 In EOS if we send 0.1 EOS the recipient receives the full amount of 0.1 EOS. The transaction fee is paid by the network. For the user this is a "free" transaction. What stops the network from being spammed is that the amount of resources your " account computer" has only allows you to make a finite number of transactions within a 24 hour period after which the capacity of the "account computer" is depleted and will have to be "recharged", before it can be used again. This is an ingenious solution! It cost a minimum of 0.2 EOS to open an account. We can see that if 1 EOS is worth say $1000 one day, it would cost $200 to open up an account! This will severely affect the number of users right? Wrong! You only need an EOS account if you want to use the EOS blockchain, hodling, holding voting and moving EOS tokens, running your Dapps. Remember that EOS is a computer, and as a developer of a Dapp (ono) you will need to stake a certain amount of EOS to have access to CPU, Bandwidth and Ram on the EOS computer for your users to make transactions. The more popular and successful your Dapp the more resources you will need. Your users will sign up to your Dapp and they will use the services you offer without the need to own any EOS tokens or open up an EOS account. You can even reward your users with your own native tokens (ONO). This runs separate from the EOS blockchain. If the project fails you simply sells your EOS back into the market! This is like putting up capital to start a business and if the business fails you simply resell the assets to recoup your capital. Now, this is a model for mass adoption! Expect to see a hosts of Dapps similar to Facebook, Twitter, Telegram all running on the EOS platform. Their users can singup to use these applications and they do not need to hold any EOS tokens or have an EOS account. To drive the point home. 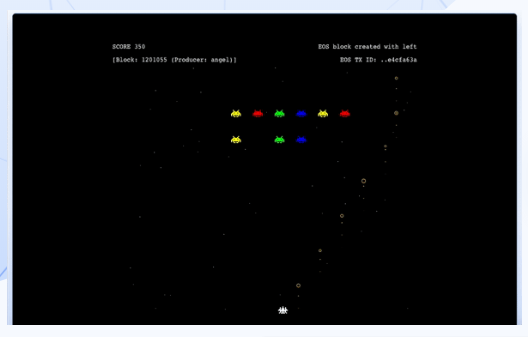 Remember the game of space invaders? 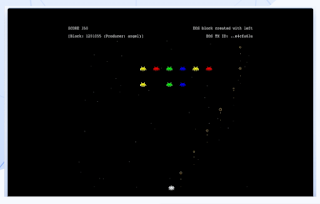 You can run this program on your little Z80, Atari, Commodore or Apple computer. It uses the CPU, bandwidth and Ram resources on your little computer. Well you can run this program on your little "Eos Account" computer. All the moves will actually be recorded on the EOS blockchain in real time. Unlike Bitcoin, transactions (moves) on the EOS blockchain are extremely fast. Send a token and by the time you refresh your page the transaction have already confirmed on the blockchain. This is so incredible that you can run Virtual Reality applications on the EOS blockchain. The mind really boggles on what this EOS computer is really capable of. Think decentralised stock exchanges, micro transactions and instant payment systems. So what is EOS and where is EOS headed? The inventor of EOS is Dan Larimer. Prior to EOS he has already cut his teeth on Bitshares ( a decentralised exchange ) and Steemit ( a decentralised social media platform). Steemit and Bitshares currently occupy the top two spots in number of transactions processed as tracked on Blocktivity. These two projects are running on their own blockchains. Since then, Dan Larimer has announced that he will soon release Steemit 2.0 and Bitshares 2.0 on the EOS blockchain! and on top of this he will also introduce a stable coin. We don't know what Steemit 2.0 and Bitshares 2.0 will be like but we can be very sure that they will be huge improvements over their previous incarnations having learned from the experience. A stable coin too! like Tether? The basis of a stable coin is the asset backing ratio. Tether boast a 1:1 ratio with USD but they have difficulty proving this. BitUSD on Bitshares is said to have a 3:1 asset backing. How will this new stable coin be received? This is what is so incredible about EOS. Everything is different and new, and yet, so far, it all works! Even before any Dapp is launched on the platform there is already a marketplace for Ram and soon Account Names too. Only stands to reason that a market for renting EOS tokens will develop in the near future. My conclusion is that the EOS as a platform will dominate the crypto space, and EOS as a token will be worth very much more than it is now. EOS is a blockchain, a community and a society all in one. A society is only as good as the people who run the system and in EOS these are the block producers. It is so refreshing to see that in EOS, the people we elect to rule over us actually have to be nice to us. We elect our block producers with our votes Daily. It is crucial that we counter the influence of whales who may be block producers themselves and who will vote in their own interest. We need to expressly know the objectives, motives and actions of these block producers. Most users will not have the time or expertise to question, query and research these block producers and hold their feet to the fire, so to speak. They can however delegate their vote to proxies who share the same interest as them, to vote on their behalf. I think that investingwad will vote with our interest at heart. You can set your proxy with the Greymass wallet. Or from their Github account. The downside is that if EOS are lost, the resources they represents are also lost to the network and cannot be used by anybody else. In Bitcoin, when coins are lost, they have no effect on the performance of the platform. This is why EOS has a policy or proposal to "recover lost resources" after 3 years of inactivity. This is like saying that every EOS account has a temporary 3 year lease on the resources it controls and if they are never used then these resources can be reclaimed by the community. Contentious, but we can agree that these resources are precious and should not be lost to the community. There may be amendments to this policy as everything in EOS can be changed, if the community agrees by way of referendum. Nice post regarding bitcoin and bitshares.. Thanks for sharing such a valuable information.. The global ecosystem dedicated to cryptocurrency. Register now and get access to the first phase of the ICO at 0.01$. at A global ecosystem around Cryptocurrency! For the successful trading of your in-hand digital currency you must needs the Best Cryptocurrency Exchange Software. First you have to research which company provides best platform and also have the best team of developers. A longevity Platform with a technology ecosystem that is designed by professionals in the health longevity sector. Blockchain and gambling are merged into one. The Eden tokens are needed to directly take part in daily, monthly and annual raffles and they function both as participation and profit. It’s safe, transparent and tamper-proof thanks to Ethereum Smart Contracts. The Airdrop is limited to 1,350 participants. The Airdrop only takes places once the Softcap of 3,000 Ethereum (ETH) has been reached. The Airdrop can be terminated without notice by the eden.best UG. There’s no legal claim. Bincoin is a decentralized cryptocurrency payment system that was created cryptographically which run on an open source software and it is not being controlled by any entity. The Bincoin cryptocurrency payment system is not govern by any government or bank. Investors can use services to divide their investments between various services like P2P loans, Merchant Gateway , Crypto Exchange, etc. The first version of the BIN allows startups to launch and manage ICO campaigns. Secure, decentralized, and borderless social trust. 3.33% of deposits are paid out daily, down to the minute. Earn 1.25% referral commissions indefinitely! aren't the only method to obtain ETH. The exchange later explained that it happened because of an error in their server, even though the exchange has made a decision to ignore the losses occurred as a result of server issue. In truth, it is smaller crypto exchanges which are now offering some pretty rare services and functionality that may make your day-to-day crypto endeavours a bit simpler. We are a fund management firm built by investors, for investors, and we excel by focusing on truly active management of differentiated investment strategies. Blockchain-based Crypto-artwork with algorithms to always be more expensive than any other artwork in the world by Frederik F. Mettjes. World’s Most Expensive Artwork, an artwork made by the freelance artist and illustrator Frederik F. Mettjes, launched as the very first of its kind crypto-artwork of the planet. The artwork is programmed by the blockchain-based ‘smart contract’ algorithms to be costlier than any other artworks in the globe. For the first time ever use your #Cryptocurrency to invest in emerging companies. The ILO Exchange a new investment opportunity open to holders of Cryptocurrency. Finally an #investment opportunity made for the 21st century. Unity Exchange just launched there early sale ICO for there brand new platform! There concept is simple weather you trade or not you'll receive all the dividends in multiple cryptocurrency that corporations would usually pocket themselves! It's so simple, deposit there token into the block, get btc, eth, xrp, usdt dividends daily and whenever you feel you've profited enough just pull your investment out! Compounding is possible simply use your profits to buy more of the block for higher profits!! There white paper looks amazing! While not much has transpired since my last Ripple Newsupdate, there have been a few recent developments that I wanted to touch on this week. Ever since October 2008 and the publication of “Bitcoin: A Peer-to-Peer Electronic Cash System” under the now-infamous pseudonym, the world has attempted to discover the true identity of Satoshi Nakamoto. Over the past decade, guesses have ran the entire gauntlet of possibilities, from Dorian Nakamoto (a good guess considering his birth name was indeed Satoshi Nakamoto) to Nick Szabo or Craig Wright. Why is Bitcoin Price Rising. The Answer May Not Be What You Think.